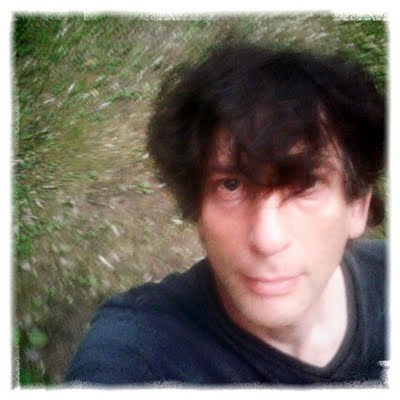 Neil Gaiman's Journal: "From the Desk of Mr Amanda F Palmer"
"From the Desk of Mr Amanda F Palmer"
If you go outside the house the world is an oven filled with soup-like air and biting insects, so I am spending every moment possible inside. I went for one walk today and by the time I was far enough away from the house to make the dogs happy, I realised that I should have worn bug-spray. This is a photo of me a few hours ago wishing I had worn bug spray. Toward the end of last week I looked at a map and realised that Burlington Ma. was the town next door to Lexington Ma. This made me smile an excited sort of smile, as I knew that I would be sleeping in Lexington on Saturday night, in Amanda's family home, and had just learned that a convention-full of old, good friends was happening in Burlington, a seven minute drive away. I sent messages to my friends who I knew were attending - John Clute and Liz Hand, Ellen Kushner and Delia Sherman, Geoff Ryman and Peter Straub -- and asked when would be a good time to swing by. Peter Straub wrote back and said that 11-12 was out for him, as he would be attending the Shirley Jackson Awards. Which rang a bell. I went and checked online. Yes, I was nominated for a Shirley Jackson Award. Actually, I was nominated for two of them, for STORIES as Best Anthology, and for "The Truth Is A Cave In The Black Mountains" as best Novelette. I had been thrilled when the Shirley Jackson award nominations had been announced, but that was many months ago and I had forgotten when or where they were going to be awarded. Now I had a dilemma. I wasn't sure of the protocol - should I go to the awards ceremony, even though I wasn't going to the convention, and was only popping in to introduce some friends to Amanda and to see people I had missed seeing...? Or should I just see my friends. I had no idea. I hadn't really been to a convention I wasn't attending before. Would I be seen as snubbing the awards if I didn't go? But would I be allowed in if I wanted to go? As it was, the decision was made for me. I arrived, hugged John Clute and Peter Straub and Geoff Ryman (and Samuel R Delany and John Crowley and Ellen Datlow and oh, so many other people), and was immediately handed two engraved stones, just the right hand-shape and size for throwing at a Lottery Winner, each engraving saying that I was a nominee for the Shirley Jackson Awards, and I was told that I was definitely invited, and should be there. I followed John Clute into the Awards, sat with him and Amanda and Maria Headley (someone handed me my convention nametag. It said MR AMANDA F PALMER. I relaxed, now I had a nametag, and no longer feelt like I wasn't really at the convention). And then STORIES won Best Anthology. And just when I had recovered from that, "The Truth Is A Cave In The Black Mountains" was awarded Best Novelette. And so I made speeches, and had my photo taken a lot, and kept wishing that I'd shaved for the photos (which I'm vain enough to have done if I thought there was any possibility that I would win one), and all in all it was a wonderful surprise, like getting an extra birthday in a year you hadn't known about. 12 hours before then I hadn't even known there was an awards ceremony going on, and now I had won two awards, and Amanda was smiling that smile she does that showed that she was having a wonderful time as well, just being proud of her husband. I hugged Caitlin R Kiernan. I got to meet Kestrell, who has Delirium eyes (as documented in http://journal.neilgaiman.com/2010/10/neil-gaiman-what-are-you-doing-in-my.html) which made the day even more perfect than it had been before. STORIES just came out in the US in paperback, by the way. Lots of wonderful stories of all kinds by a glorious flock of authors. You should buy it. It just won an award. And then I went and had lunch in the pub with too many old friends and was happy. Amanda and I left the convention and headed to Cambridge, wandered into Harvard Square, where we watched a human statue and ate watermelon in the street. A man took our photograph and told us that soon there would be Bastille Day Waiter Races. Then I got into a taxi and went to the airport and flew home. Amanda watched the waiter races and texted to tell me who won. I'm finally making my first trip to New Orleans in September and I really want to go check out The Green Goddess since you've spoken so highly of it. I'm convincing my mother and her colleagues to try it on the basis of the super-cool special treat triggered by a secret password, so I was wondering if a) the Meze of Destruction is still a valid password and b) how in the world do I actually pronounce meze? Is it may-zai or meh-zee or...? It's still going on. If you eat at The Green Goddess in New Orleans, tell them you want the Mezze of Destruction. If the waitperson tells you it isn' going on any longer or something, tell them to check with Chris (the chef). It's just the code for Neil Sent Me. And Mezze is pronounced closest to Mezzay, but I've heard it pronounced a dozen other ways so I would not sweat it. Regarding Google+, you're right; it is in beta and I don't think it was designed with people like you in mind right now, but it will get better. Other celebrities have voiced similar complaints, that they don't have the granularity of alerts and notifications they need when they're being added by a thousand people a day, and genuinely know about five of those people. I think maybe it's not quite ready for people like you yet, who'll have a large web presence on the site but don't really spend much time at all *thinking* about their web presence or personally managing it. I'm sorry people told you You're Doing It Wrong when the actual answer was probably closer to This Is Not Your Thing Right Now, which I find tends to be more accurate and reasonable than You're Doing It Wrong, almost 100% of the time. The people who told you "It's not like Facebook, it's like Twitter!" were wrong. It's not really like either. If you want to write a short update with a general blast, it's like Twitter. If you want to write a blogpost with a public audience, it's like a blog site. If you want to write a blogpost with a closed audience, it's like Livejournal. If you want to start an online conversation with only four participants it's like an e-mail thread. And if you want to build and share with discrete communities of people and interact with folks you know, it's like what Facebook *says* it is but isn't. There is no "it's like this and you're using it the wrong way," but that means there's a lot of flailing around to use it until *they* figure out a way to help people flail less initially. That's a developer's job, to help people use their stuff more effectively and efficiently, and that's what beta testers are for, to tell them ways they're succeeding and not succeeding at it. I hope to see you back in a year or so when they've got the functionality a little more manageable for folks like you. A lovely and odd digital poetry game (now fixed! ), with a title much inspired by your prose. Please do share with your legions of followers.